Many experienced designers have recently started advocating for designers to learn business. Equipped with business knowledge, designers can make better decisions that benefit users and businesses. “Designers, become business-minded or become irrelevant.” - Bobby Ghoshal, Chief Design Officer at Candid Co. While there are many resources explaining why designers should learn business they don’t cover what designers should learn. This guide is my attempt to fill this gap. It is based on my experience, working as a business designer at IDEO and creating the d.MBA, a business course for designers. I would like to point out that I am not advocating for designers to stop being user-centric. Users are still our first priority. But understanding business and becoming fluent in business language will make it easier to convince non-designers into user-centric ideas. Industry analysis is not just a boring business exercise. It helped the founders of Warby Parker create a company worth over $1B. Their analysis showed that the eyewear industry is dominated by a single player, Luxottica, which kept prices of prescription glasses artificially high. A pair was priced at around 300$ even though it cost only $10-$20 to produce. Through this analysis, founders found a way to create prescription glasses much cheaper ($100) by selling them directly to consumers (bypassing middlemen), designing them in-house (cheaper than hiring external designers), and limiting the offer to only a few models. Today, the company is a major player in the eyewear industry with over 1,600 employees, more than 80 stores, and valued at $1.75B. The best framework for industry analysis is Porter’s Five Forces. It evaluates five competitive forces, which influence industry attractiveness. 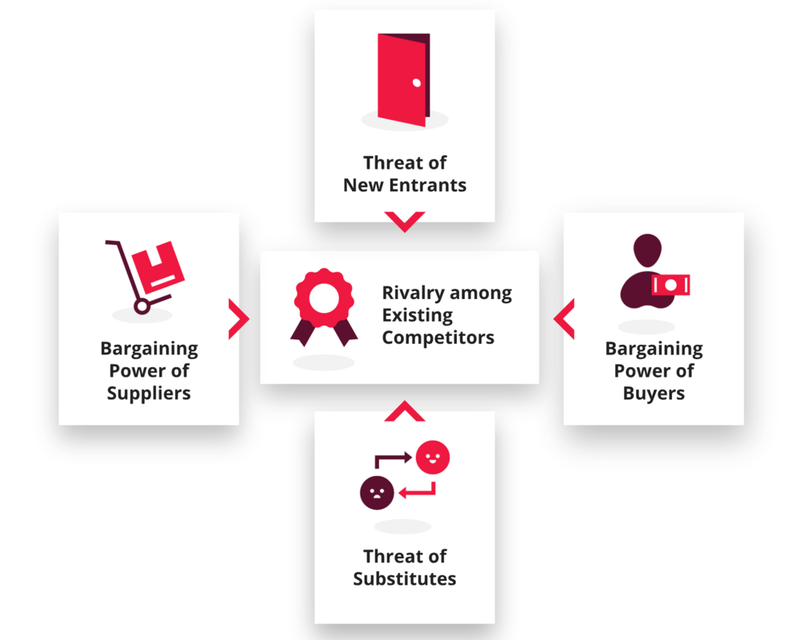 The basic idea is that your product or company is not competing just with direct competitors but with everyone in the ecosystem, including customers, suppliers, substitutes, and new entrants. For example, you might have very few competitors but you still can’t make any profit because your suppliers have more negotiating power and so they capture most of the profits. Threat of New Entrants - How hard is it to enter an industry? Bargaining Power of Buyers - How easily can buyers drive our prices down? How well can they negotiate? Threat of Substitutes - How else can customers satisfy the same need? Bargaining Power of Suppliers - How easily can suppliers drive their prices up? How well can they negotiate? Rivalry Among Existing Competitors - How many competitors are in an industry? How strong are they? You can analyze an industry by looking at each of the five forces and giving them a low, medium or high score. For example, the Threat of New Entrants in the banking industry is low. It is relatively hard to get a banking license and become an official financial institution. On the other hand, the Threat of New Entrants is relatively high for a mobile app game. Just look at the number of games in the app store. This type of insight is extremely important. If you know that the Threat of New Entrants is high and that your product can be easily copied, you can focus your design efforts on that aspect. What can we do to differentiate our product in a defendable way? What unique features can only we offer? Should we look for partnerships? Note that we always analyze from the perspective of a company that is already in the industry. We want to figure out how attractive this industry is if you are in it. In January 2007, Apple has unveiled iPhone, which eventually killed the giant of the industry - Nokia. How did that happen? Let’s not forget that at the time Apple was a completely new player in the cell phone industry while Nokia was already making €7B in revenue. When iPhone was introduced, Nokia’s board of directors has decided to ignore it. Truth to be told, iPhone was technologically inferior to Nokia N95. However, they overlooked that iPhone offered a completely new concept of a phone (computer first, phone second). It reimagined phone’s value proposition and used a different business model (app store). Nokia has conducted a very poor analysis of Apple’s iPhone by looking through a very narrow technological lense. This mistake eventually crushed Nokia’s leadership in the market. 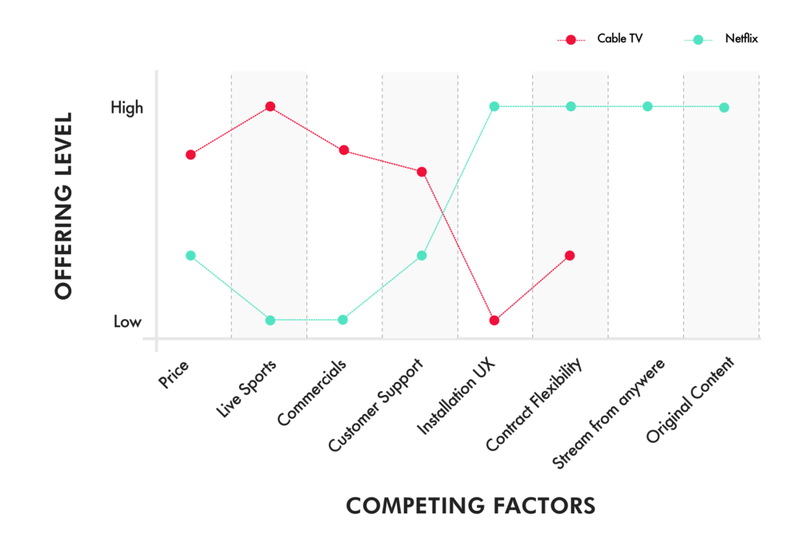 Understanding competitors’ strategy, business model and future plans help us design better products and experiences. We can anticipate how competitors will react to our innovations, and how we can differentiate better (create unique value for our users). The first step of competitor analysis is identifying competitors. Even if it seems you don’t have any, there usually is some. Even the only Italian restaurant in town has plenty of competition. There are other types of restaurants, there are supermarkets, bakeries, home-cooking etc. In order to find all our competitors, we need to broaden our thinking. Competitors can be divided into direct and indirect. In general, we divide competition into direct and indirect competitors. Direct competitors are companies that offer the same product (or service) and indirect competitors offer a different product that solves the same problem. For example, Uber’s direct competitors are taxi companies and Lyft. The indirect competitors are bike sharing services, public transport, car sharing services, and walking on foot. We never know what data will turn out to be interesting and useful so we have to start wide and look at all three buckets. To kick-off your analysis, you can download my Competitor Empathy Checklist with a list of 15 data points for analysis. I always start with these 15 points but then extend the research to other data points, depending on what I find in the first phase. For data gathering, I recommend using a spreadsheet. It is the most flexible and comprehensive way of collecting large amounts of data. It helps structure the process and speeds up the synthesis. Once you find relevant data, it’s time to draw actionable insights. The best process for finding insights is skimming and color-coding. Go through the data you have gathered in a spreadsheet. Read through it quickly and look for patterns. If you notice that certain data is connected start color-coding it to represent the connection. This synthesis process is similar to synthesizing user research. We just use a different type of data. By learning about competitors you will start predicting their moves. And you will know better how to adjust your design. For example, if you realize that your competitors are mostly focused on local markets and you want to expand globally, you can start learning how you can localize your product. In 1995, Amazon online store went public for the first time. At that time, it was merely an online bookstore. But even back then Jeff Bezos had the vision to create an “everything store”. He understood, however, that he needs to start somewhere where benefits of an online store would be most apparent. After a careful consideration of more than 20 product categories, he chose books. From the strategic perspective that was a great decision. There were more than 3 million books in print and traditional bookstores could only stock a few thousand because they had limited shelf space. On the other hand, an online store can offer all 3 million books. Creating additional product pages on the online store costs (almost) nothing. So, strategically, Jeff really played on the strength of online stores and optimized the whole experience around that. Today, Amazon is an “everything store” but it all started with the careful decision of what not to do. In general, business strategies explain how a company tries to beat the competition. In an ideal world, every business decision is aligned with a business strategy. Even design decisions. So, having a basic understanding of your company’s strategy is extremely important. However, Strategy is one of the most misunderstood concepts in business. “Our strategy is to increase revenue by 20% in 2020.” You can hear similar statements all the time but they are classical examples of strategic misconception. Let’s quickly cover what strategy is and isn’t. The ultimate goal of a strategy is to help us gain a competitive advantage, which leads to better financial results. For example, Southwest Airlines has had 45 consecutive profitable years in the airline industry, which is known for low profit margins and bankruptcies. All due to a great business strategy. One of the best classifications of business strategies was introduced by Michael Porter. In essence, the idea is that every business can compete with (1) cost leadership, (2) differentiation or (3) focus. Companies that try to beat competitors by offering lower prices are pursuing a cost leadership strategy (Aldi, Walmart, IKEA, Southwest Airlines, McDonald's, etc.). On the other side of the spectrum are companies that want to win by being unique. These companies can charge higher prices because they are perceived differently (Apple, Whole Foods Market, BMW, Qatar Airways, Four Seasons Hotels, etc.). The third strategy is focusing on a certain customer segment within the industry. Instead of creating an industry-wide product, a company chooses a certain customer segment and prioritizes all activities to become the best in the category (e.g. Porsche, Pepsi, LinkedIn etc.). These three business strategies, explain how you compete in an existing market. On the other hand, a Blue Ocean Strategy explains how you escape competition by creating new markets and industries. by combining cost-leadership and differentiation. It eliminates certain competing factors (low-cost aspect) and focuses on those that matter the most to customers (differentiation aspect). Instead of fighting with competitors (aka red ocean), it is making competition irrelevant (aka blue ocean) by attracting completely new customers to the market. Some prime examples of blue ocean products are Airbnb, Skype, Zappos, Salesforce, and Wikipedia. In my opinion, Blue Ocean Canvas is one of the most useful tools for designing strategies. It’s also very close to designers’ skillset because most decisions rely on understanding customers. Blue Ocean created by Netflix on-demand service. create your blue ocean offer by asking what competing factors can we eliminate, decrease, raise, and introduce. Make sure that your blue ocean offer is really different, not just better. It should not follow the same basic pattern of the dominant industry line (red line). It must show a completely new way of doing things in an industry. You can read more about the Blue Ocean Strategy in this book. Technological breakthroughs are no longer sufficient for commercial success. In the age of rapid and abundant innovation, focusing just on a product is no longer enough. Research shows that business model innovation has a bigger impact on business success than a product innovation. Think about solar panels. Their price has been going down since the 1970s but the technology finally took off around 2010 with a new business model. Some solar companies started offering zero-down payment, where customers did not have to pay anything upfront for an installment of solar panels. These companies would also take care of the maintenance and management of panels. This completely transformed the value proposition, which meant a much wider acceptance of the new technology. It’s crucial for designers to start looking beyond products to really grasp how customers get value. User experience is not just how somebody uses a product but also how they pay, maintain, upgrade, and dispose of a product. Actors: Who is involved in the creating, delivering and capturing value (individuals, companies, partners etc.)? Flow of information: How is information flowing among actors? What type of information? Flow of goods: How is a product or service flowing from a provider to a customer? Flow of money: Who pays whom? How does money travel? The Ecosystem Map (business model visualization) for Netflix. On the right, you can see the example of the Ecosystem Map for Netflix. You can create such a map by outlining actors in the ecosystem and defining relationships among them. The map needs to represent three parts of a business model: how a company creates, delivers, and captures value. The value creation part describes how a company creates a product (left side of our map). The delivery part describes how a product gets to customers (lower part on our map). And the value capture part explains how customers pay for a product (upper right side on our map). To design new business models, you can use the ecosystem map, capture the status quo and think about possible iterations. It turns out that most successful business models follow similar patterns. Researchers from renowned business school St. Gallen found out that 55 business models are responsible for 90% of the world’s most successful companies. You can download 55 pattern cards here and use them to brainstorm new business model iterations. For example, one of the patterns is “Pay per use”, which describes a revenue model where customers pay only when they use a product. This could be one starting point for your brainstorming. Could we sell our product as a service where customers only pay for use? Imagine working on a product that would lose over $1B in the first 2 years? Horrible, right? Well, that is exactly what happened to Disneyland Company when it opened its first Euro Disneyland. Disneylands were a great success in the USA so they decided to expand to the European market. Soon after opening, it became clear something is wrong. It was loosing more than $1M every single day! In planning for Europe, Disney was drawing upon its experience from the American market. American visitors stayed on average for four days, ate in Disney restaurants throughout the whole day, and bought a lot of high-margin merchandise such as t-shirts and hats. On the other hand, European visitors stayed on average only two nights, they all wanted to eat at noon (Disney restaurants were not ready for midday peak so some visitors had to leave the park to get food), and they didn't buy high-margin merchandise. All of that could have been prevented if Disney had surfaced these unconscious assumptions in a financial prototype. And just as designers create visual prototypes to test desirability or usability, businessmen create financial prototypes to test viability. Such prototypes help uncover potential gaps in our ideas before we invest too many resources. They also inform our product design. For example, if we uncover that our idea is only viable if we raise a price, we have to find a way to position it differently to justify a higher price. For this process, we can use Discovery Driven Planning (DDP), a method introduced by professors McGrath and MacMillan. It uses simple math to quickly identify risky assumptions and help us systematically test them. The idea of DDP goes against traditional business planning (used by Disney in our case study) where you make tons of assumptions and hope they are right. Here, we try to uncover assumptions, create prototypes, and test them. 1) In the first step, we state the end goal of a project. For example, let’s say we are opening a restaurant and our goal is to make $100k in profit per year. To achieve that we assume we will need $500k in revenue with 20% profit margin ($500k x 0,2 = $100k in profit). This means that we can spend $400k on costs ($500k-$100k=$400k). 2) In the second step, we lay out all assumptions required to make this work. For example, if we want to achieve $500k in revenue, our monthly revenue has to be $41.666 (500k/12months) and daily revenue of $1.388 (41,6k/30days). Furthermore, if an average customer spends $15, we need to serve 92 clients per day (assuming we are open 7 days per week). Now, we should also calculate the space required to accommodate 92 clients (rent cost), personnel required to prepare and serve 92 clients (staff cost), food costs, kitchen operations etc. For example, let’s look at kitchen operations. In order to serve 92 clients per day, our kitchen would have to prepare 92 main dishes. If we assume equal distribution of clients throughout the day and 8-hour workdays, this means the kitchen should be able to prepare 11.5 main dishes per hour (92/8 hours). This is just one example. When you prepare your own prototypes, do similar calculations for all revenue and cost associated activities (marketing, staff required etc.). This is just a short list based on a few assumptions we made. As already mentioned, your version should cover all assumptions as indicated in the final bullet point. 4) The last step is creating a testing plan where we create small tests to verify assumptions. For example, we could test the feasibility of preparing 11.5 dishes per hour. We could simply hire a kitchen staff for half a day and track their performance. This is much cheaper than actually opening a restaurant. Once we run the test, we have to revisit the assumptions document. With every new experiment, we should be getting closer to creating a viable and feasible version of our concept. To learn more about Discovery-Driven Planning I suggest reading this great HBR article. Most designers shy away from analytics. I think we are afraid that if we get too data-driven, we will lose the very thing that makes us designers: empathy. We fear that we will start making design decision just for the sake of numbers and forget about humans. First of all, data is not bad. In general, more data means more informed design decisions. It also helps us avoid opinion based discussions and unite a team. Having a clear goal helps a team align, focus its efforts in the same direction and speed up the decision making process. Furthermore, we designers often can't really prove the value or progress of our work. Quantifiable metrics can also help with that. You might still be asking: How do I make sure that I am doing the best for users and not just driving business results? Inspired by the great work of Kate Rutter, I came up with the concept of Design Metrics. While most business metrics measure value captured (revenue, profit, costs, growth) design metrics measure value created for users. What does success look like for our users? What is the main action that a user has to take to extract value from our product? Google Calendar is positioning the + sign (bottom right) for adding new events as the main call to action. In the first step, we need to identify product’s main value proposition. For example, Google Calendar’s main value proposition is staying organized and on top of a schedule. In the second step, we look for key product interactions, which indicate that users got the value from our product. Let’s say that in our Google Calendar example, the most important interaction is creating a new task because it helps us achieve the main value proposition. Now, we have to turn this product interaction into an awesome metric. OK metric: “new events created per week”. This is a potentially misleading metric. It could go up because we are just adding more users but actually, each user, on average, could be creating fewer events. Good metric: "New events created per week per user". It starts measuring user behavior and value created per user but it is still averaged out over the entire user base. Outliers might skew the average. Great metric: "% of users who create a new task, per week". It tells us what percentage of the user base is taking action. Outliers don’t matter anymore. Awesome metric: “% of users who create 3+ daily tasks, per week". It’s an awesome design metric because it has a specific amount of action that users need to take to extract the value from a product. We can also measure and compare it weekly (to see if we are progressing) and it takes individual users into account. Understandable - You should be able to remember, understand and discuss it. Actionable - You know how to change your design based on it. The opposite is a vanity metric such as a number of total app downloads, which can only increase and hence does not give any actionable information. Normalized (i.e., ratio or rate) - Compares factors that are opposed (e.g., the ratio of paying vs. freemium user helps understand if we have a good balance of paying customers), which helps understand what we need to work on. Another tool to help you structure your metrics is Design Metrics Canvas. It helps find the balance between design and business metrics (covered in the next chapter), identify supporting metrics (additional metrics that help understand the main one), and define counter metrics (measure what could go wrong if we over optimize for the main metric). When you present your work to non-designers, you have to use their language. They don’t care about how things look or feel, they care about the effect it will have on the business. And that is expressed in business metrics. Next time you want to convince executives, try this. First, talk about the design (and users) but then immediately translate the benefits into business metrics. To find out what metrics your audience cares about, simply ask them: “What is the main goal of this project? How is it measured?”. From there on, your job is to show (and prove) how your design can help affect that goal. To kick things off, we’ll cover some of the most common business metrics. Return on Investment (ROI) - popular measure for the efficiency of investments. It is calculated by dividing the profit or loss with the money invested. For example, if our company invested $100 million and made $50 million in profit, the ROI would be 50% ($50M/$100M). ROI is a great tool to compare different investments. Generally, we want to invest more resources into projects with higher ROI. Monthly or Annual Recurring Revenue (MRR or ARR) - relevant for companies that have a subscription revenue model. It shows how much revenue a company makes per month or per year. For example, if a subscription service has 1 million monthly subscribers that pay $10 per month, its MRR is $10 million. Customer Acquisition Cost (CAC) - the amount of money a business spends to acquire a new customer. You can calculate it by adding together marketing and sales costs and then dividing them by the number of customers acquired. For example, a company that spends monthly $5.000 on marketing, $5.000 on sales, and acquires 100 new customers, has the CAC of $100 (($5.000+$5.000)/100 customers = $100). Fixed Costs - costs that don't change regardless of the number of goods produced. Common examples of fixed costs are rent, utilities, insurance, interest expense, annual salaries (for employees with a fixed annual salary), depreciation of assets etc. Variable costs - costs that do change with the number of goods produced. Common examples include direct raw materials for physical goods, credit card fees, commissions, and shipping costs. Active users - a total number of active users in a given time frame. Usually in the form of monthly active users (MAUs), weekly active users (WAUs), or daily active users (DAUs). Definition of an active user depends on a product. For Facebook, MAU is a user who logs in at least once a month. For Uber, it is a user who books at least one trip per month. Customer churn - a rate at which customers are unsubscribing or no longer buying from a company. For example, if we had 500 subscribers at the beginning of the month and lost 50, our monthly customer churn rate is 10%. Ideally, churn should be as low as possible. A good annual customer churn rate for SaaS companies is somewhere around 5-7%. This is a short list of the most commonly used metrics. To find out what metrics matter for your company, talk to a colleague from different departments and ask them about their metrics and KPIs. And when you come across a new metric, just look it up on the Investopedia, which provides great definitions with examples. Draw the Ecosystem Map for a business model of your current business or client. How is value created (what is necessary to create a product), distributed (how does a product or service travel from provider to customers), and captured (how do customers pay for a product)? Fill out the Design Metrics Canvas (get it here). Find out how you can measure design and how you can connect it with business metrics. You can also use the canvas to present your design work. Conduct the competitor analysis (you can get Competitor Empathy Checklist here) to see who you are competing against. Create a spreadsheet, start by gathering 15 data points from the checklist, and shape insights. If you are serious about learning the business, you can also join us in the d.MBA program. It provides an expanded look into all seven chapters covered in this guide along with case studies and detailed instructions for all exercises. The next intake starts in March 2019 and is limited to 30 seats. Learn more about the program by joining the waiting list below.